“Do you have a sense of an underlying commonality among the artists or writers you are highlighting?” Michael Barron asked Music & Literature’s editors, Taylor Davis-Van Atta and Daniel Medin, in a recent interview for New Directions. The question was particularly fitting for M&L no. 4, since what draws Brazilian novelist Clarice Lispector, Swiss violinist Maya Homburger, British composer/double bassist Barry Guy, and American poet Mary Ruefle is not obvious at first glance. In the print magazine, each artist is contained within their own section, but in a live event, their voices hang together in the air, something of one’s resonating with something of another’s—hesitantly, curiously, sometimes touchingly. Many attendees at the two recent Paris launches came for Lispector and ended up equally loving Homburger and Guy; others came for Homburger and Guy and walked away also adoring Ruefle. The unexpected joy in discovering a sympathy, even if not a direct correspondence, between writers, musicians, and composers, between artists you love and artists someone else loves, is what Music & Literature has always hoped to make possible. Left to right: Barra Ó Seaghdha, Taylor Davis-Van Atta, Daniel Medin, Maya Homburger, Barry Guy, Chloe Elder, Madeleine LaRue, Tatiana Salem Levy, Leonardo Tonus, Géraldine Chognard (front). Le comptoir des mots, Paris. 25 June, 2014. Photo: Dan Gunn. Barry Guy surveys the shelves at Le comptoir des mots prior to his performance with Maya Homburger. Photo: Dan Gunn. The music, of course, needed no language, but the readings often required two or three. After Homburger and Guy’s wonderful opening and a few words of welcome (from Géraldine Chognard at Le comptoir des mots, and from Joachim Umlauf at the Goethe-Institut), the work of Clarice Lispector took center stage. At Le comptoir des mots, Daniel Medin and Taylor Davis-Van Atta read (in French and English, respectively) a particularly funny letter of Lispector’s, written in 1974 to the daughter of Lispector’s psychiatrist and included in M&L no. 4. Then Leonardo Tonus, an expert in Brazilian literature at the Sorbonne, added a few words on Lispector’s enduring influence before introducing Tatiana Salem Levy, recently selected as one of Granta’s Best Young Brazilian Novelists. Salem Levy spoke, very engagingly and in French, of the complicated history of her relationship with Lispector, both as a reader and a fellow woman novelist in Brazil. Afterward, I read a few lines of her essay in English, translated especially for M&L no. 4 by Ana Fletcher. At the tip of the pencil the line. at the tip of the sword is magic—that's where I'm going. At the tips of the feet, the leap. After I die I will become great and I will scatter myself, and someone will lovingly say my name. Towards my poor name is where I'm going. At the extremity of myself, there I am. I, imploringly, I, the one who needs, who asks, who cries, who is sorry. But the one who sings. The who speaks words. Words thrown to the wind? what does it matter, the wind brings them back and I possess them. What am I saying? I'm saying love. And on the brink of love, there we are. Leonardo Tonus in conversation with Tatiana Salem Levy prior to the first event. Photo: Dan Gunn. Bilingual readings served as literary bookends to Guy and Homburger’s performances on both evenings. After being introduced by Taylor Davis-Van Atta, Mary Ruefle’s poems charmed the entire audience twice—first in their French translations by Aurélie Maurin, and then in their original English. Although she was perhaps the least known of the artists featured in M&L no. 4, Ruefle, with her warmth, humor, and quietly powerful verse, has now, I am sure, earned several ardent Parisian fans. I read Ruefle’s originals on both nights; the French versions were read, on Wednesday, by Géraldine Chognard, and by Daniel Medin on Thursday. Barry Guy's arsenal of bows and tools. Photo: Dan Gunn. The central part of the launches belonged unequivocally to Maya Homburger and Barry Guy. At Le comptoir des mots, they were introduced by Barra Ó Seaghdha, a music critic and long-time friend of theirs who has personally witnessed the development of their musical partnership. That night, their performances were brief: they played a duet, “Celebration,” written by Guy as a birthday present for Homburger, and Guy played five solo “fizzles,” inspired by his love for the work of Samuel Beckett (evidenced by a worn copy of that author’s work that Guy carried with him throughout the night). For these “fizzles”—short, semi-improvised pieces—Guy set up a surgeon’s table of bowing tools. Once he used a paint brush in place of a bow, another time a piece of wood shaped like a bow without its hair. This last in particular drew an astonishingly raw sound out of the double bass—I thought the strings would burst or the wood splinter, but miraculously everything kept its form as a vigorous, savage sound set all our hearts thumping and ended in gasping applause. But Guy and Homburger’s true chance to shine came the following evening at the Goethe-Institut, where they played two longer sets of 20-30 minutes each. That night, they were introduced by composer Benjamin Dwyer, who read from his M&L essay “Dios los cría…” accompanied by Kimberley Campanello, who recited her French translation. Then, Homburger and Guy played from their signature repertoire of baroque and contemporary works, including compositions by Johann Sebastian Bach, György Kurtág, and Barry Guy himself (his “Rondo for Nine Birds,” which enjoyed its French premiere that evening). Left to right: Dwyer, Campanello, Tonus, Scheer, Davis-Van Atta, Medin, LaRue, Guy and Homburger (front). 26 June, 2014. Goethe-Institut Paris. Photo: Barra Ó Seaghdha. But there was, in fact, one more thing: an example of the duo’s generosity. As a surprise for Dwyer, Guy and Homburger played a piece from his composition Umbilical, a ferociously dark, difficult work. The composer was so thrilled that he kissed both their hands and, turning to the audience, affirmed, “Dios los cría!” And after two such marvelous evenings, there was not a soul in doubt. Le comptoir des mots announces M&L. 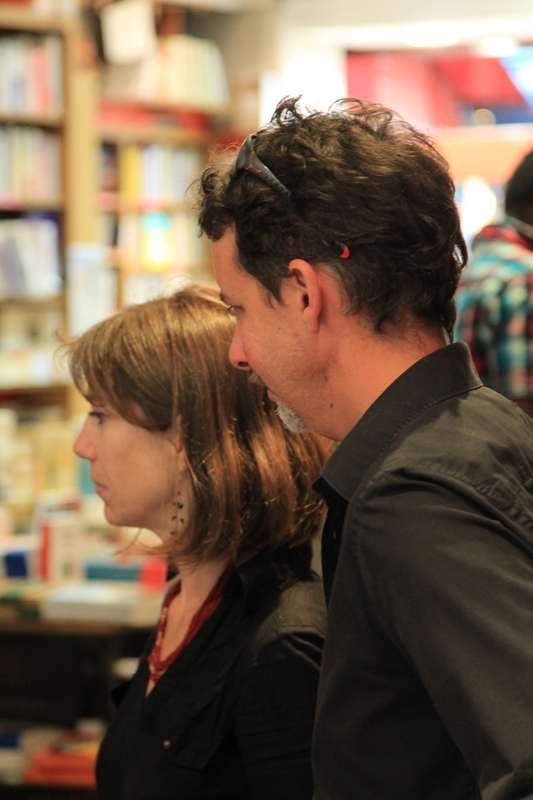 Daniel Medin and Maya Homburger at Le comptoir des mots. Photo: Dan Gunn. Barra Ó Seaghdha and Taylor Davis-Van Atta. Photo: Dan Gunn. A young spectator at Le comptoir des mots. Photo: Dan Gunn. Leonardo Tonus. Photo: Dan Gunn. Gabriella Scheer. Photo: Dan Gunn. Barry Guy and Chloe Elder talk music prior to the festivities. Photo: Dan Gunn. Tatiana Salem Levy. Photo: Dan Gunn. Spectators at Le comptoir des mots. Photo: Dan Gunn. Daniel Medin. Photo: Dan Gunn. Barry Guy practicing prior to a performance. Photo: Dan Gunn. Maya Homburger and Barry Guy perform H.I.F. Biber. Photo: Dan Gunn. Maya Homburger. Photo: Dan Gunn. Taylor Davis-Van Atta introduces Clarice Lispector. Photo: Dan Gunn. Chloe Elder and Madeleine LaRue. Photo: Dan Gunn. Barra Ó Seaghdha. Photo: Dan Gunn. Barry Guy in performance. Photo: Dan Gunn. Géraldine Chognard. Photo: Dan Gunn. Barry Guy performs "Peace Piece" at Goethe-Institut Paris. Maya Homburger and Barry Guy perform for a packed house at Goethe-Institut Paris. Daniel Medin and Madeleine LaRue reading Mary Ruefle's poetry. Maya Homburger and Barry Guy performing Biber’s Mystery Sonata No. 10 (“The Crucifixion”) at Goethe-Institut Paris. Left to right: Leonardo Tonus, Gabriella Scheer, Benjamin Dwyer, Kimberley Campanello. Leonardo Tonus introduces Gabriella Scheer. Banner photo courtesy of Dan Gunn.